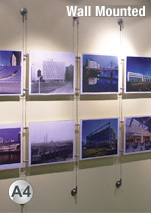 Cable Systems can be Wall or Floor-to-Ceiling Mounted! These cable systems make it easy to advertise in your business! 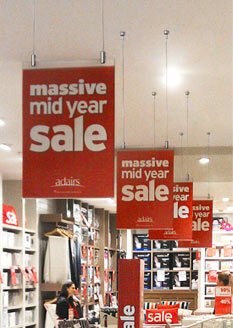 The hanging cables are a great way to promote at your location in an eye-catching manner that will surely draw the attention of passersby, all at prices that won't break the bank! The picture displays, cable systems have many different configurations available to choose from in order for you to find the right fit for your location. The different configurations we offer include various amounts of the clear acrylic pockets that you can place the graphics in. Each of the pocket combinations is available in landscape or portrait orientation that will help you to use the proper size graphics that will work best in your location. 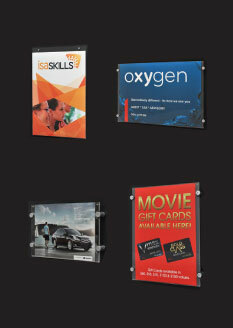 The cable systems allow you to purchase different kits to utilise various sizes of frames to work at your business. Many customers purchase the hanging cables in different packs to have larger frames that can draw the attention of passersby across the street whilst still having the smaller sizes around to provide more information as potential clients get closer to the display window! What is included with the cable systems to show your posters? The hanging cables feature acrylic pockets in a variety of sizes to hold your graphics. As mentioned above, the cable systems include the different sizes in both landscape and portrait orientation, allowing you to pick the right style that will work for both how you want to represent graphics as well as the right size to fit on your wall or within windows. 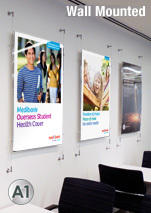 The sizes currently available to choose from are A1 (594 x 841mm), A2 (420 X 594mm), A3 (297 x 420mm), & A4 (210 x 297mm), and purchasing different kits allows you to combine the different sizes to make a more effective presentation. 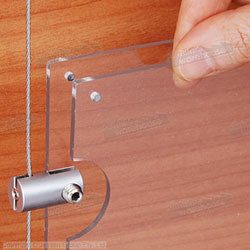 These pockets are made from clear acrylic to show the entirety of your graphics to viewers. 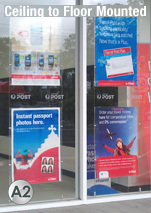 This makes it easy to read your posters, and the pockets are made from 3mm thick acrylic for both durability and style. Each of the pockets has button magnets embedded within that help to ensure that the pockets remain shut during display, which is an upgrade over previous versions that did not feature the magnets that tended to open over time. The other added benefit of having the magnets is that the graphics remain in place whilst on display! 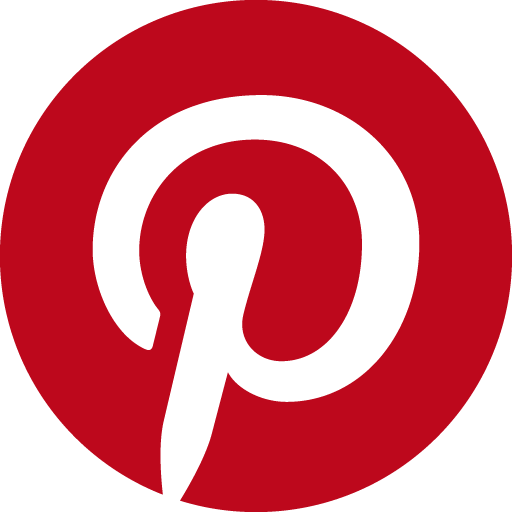 Magnets are used as opposed to screws of any type in order to make graphic changes easy without any tools required. Simply pull apart the pocket, switch the posters, and let the magnets gently re-attach, all in less than one minute for a quick and easy process! 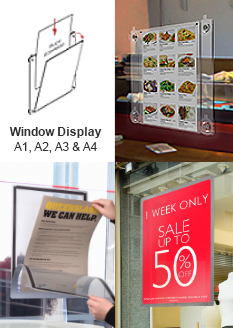 Installation of these styles of displays is easy, as we feature the necessary hardware for quick installation at your location! The most important aspect of these displays is the included stainless steel wire that is essential to mounting the system at your location. Each kit includes 2 x 3m lengths of cable, with this amount provided so that you can cut down the wire to fit your needs. 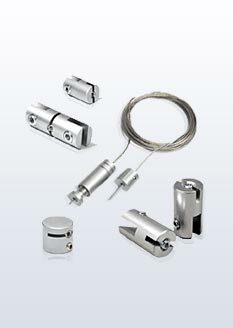 These kits are able to be mounted from floor-to-ceiling or on a wall using the included aluminium fittings. Unlike some other fittings, this style features hinges that help to maintain a straight line for you to mount the acrylic pockets to for set-up. There are stand-offs included that firmly grip the wire and plastic frames to secure them in place. You can place the pockets anywhere along the wire as well, helping you to be creative when designing your layout! 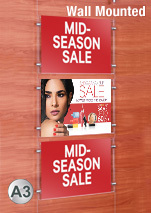 There are many uses for these displays, and the versatile fittings allow you to place them as you wish at your location. 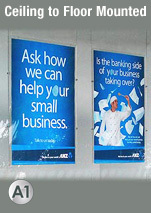 Banks wall mount the frames and give details and promotions that include information about low interest rates and special mortgage discounts. 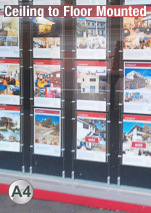 Most popularly, these displays are found in real estate agencies, where each property can be shown in the pockets so that passersby can take note of price and information. The same aesthetic applies for travel agencies, where exotic destinations can be shown and help visitors choose where they will holiday next! This vast selection of items makes it easy to find the one that will be beneficial at your location, all at low cost and made from high-quality materials to last for years to come! 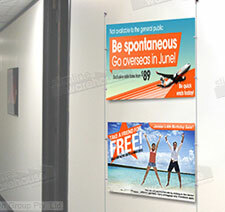 We have many types of hanging cables and other display options that can be placed in your business in order to gain the attention of passersby using unique, eye-catching poster pockets that can advertise to potential clients. 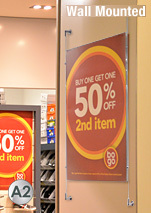 Our selection of products includes not only the wall-mounted poster displays that are on this page, but also some that can be placed from floor-to-ceiling, making them perfect for placing in storefront windows in order to advertise to potential customers outside of your business. We also have a selection of LED signs that feature different messages to call out to customers and show them that you are open, offer free wi-fi, and even that there is an ATM available inside! 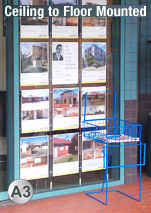 The collection of displays for windows also has floor stands on offer that can be placed near the windows to easily be seen by passersby, with graphic changes being quite simple when the stands feature one of our snap frames in a variety of different sizes. Click here to see our entire range of products that are available to purchase in our online catalogue. We have heaps of items in many categories to choose from that help you to outfit your business in a stylish manner whilst staying within the budget of your location. Our product team is constantly on the lookout for new items, sourcing goods from both local vendors & international companies in order to give our customers low-cost goods that are available at low prices! Each item has been inspected by our product assessment team in order to make sure that the items that make their way into the hand of our customers will be long-lasting. 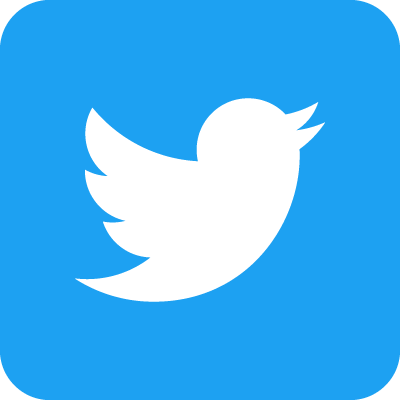 For over 20 years, Slimline Warehouse has been providing businesses with top quality goods at low prices that make a difference in promoting at their business. Same day despatch is provided with most in stock products to anywhere in Australia, including Sydney, Melbourne, Perth, Adelaide, Brisbane, Cairns, Canberra, Perth, Alice Springs, Toowoomba, Hobart, & Newcastle!